Wearing a suit means looking good, there are various suits for different occasions; hiring allows access to virtually any kind of suit regardless of the situation. When the term “suit hire” is mentioned to people it immediately conjures up thoughts of extravagant weddings and swanky black-tie events, and while this type of formal wear is the most popular to hire there is also a market for vintage suits. Vintage suit hire is required for numerous fancy dress parties and period wear festivals. The good thing about the term “vintage” is that it does not define a specific kind of suit and the options for the customer are vast. 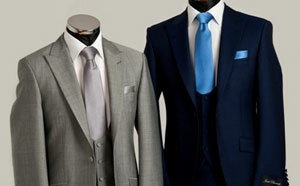 Vintage suit hire covers a broad range of outfits. Suits from the 1920’s through to the 1980’s can be described as vintage, and there are many different types of suit covering that 60 year span. The fancy dress market is the best place to look if you require this type of outfit and there are many companies in the UK that offer this kind of dress, both online and on the high street. A gangster suit, modelled on 1920’s and 30’s mobsters such as Al Capone is a popular choice of hire and this type of costume is a popular theme at fancy dress parties. This type of suit will generally be black with bold grey pinstripes and wide peaked lapels, a classic fedora or trilby hat and a white tie will complete the look. 1940’s vintage suit hire is mostly focussed on wartime outfits with classic British, American and German Army and Navy costumes available. 1950’s vintage suits tend to be focussed on the Rock and Roll era with Teddy boy jackets and bright colours aplenty. A typical 50’s outfit will consist of a red or blue suit with matching trousers and tie. The lapels and cuffs of the suit will often be of a different colour. 1960’s suits offer a lot more variety and are similar to many of today’s modern outfits. Tailoring was very popular in the 60’s and a sleek fitted suit similar to those worn by the rat pack is a good option as is a three-piece suit in the model of film star Cary Grant. 1970’s suits are definitely the most outrageous time for suits and bright colours and patterns and the popular choices, whatever suit you choose for this era, remember flared trousers are a must. If you are interested in 1980’s vintage suit hire, you may opt for the two-tone tonic suit popular with mods of the era or possibly a big-shouldered business suit similar to those famous in the film Wall Street. Unlike modern formal suits, vintage suit hire will not require any kind of specific tailoring in order to get the perfect fit. Most men will be suited by generic sizes. This is ideal when hiring as it means you can find perfect outfits from hire shops and online retailers.